Archbold Biological Station biologist and Executive Director Hilary Swain. Associate research biologist Reed Bowman holds a scrub-jay. The center’s scrub-jay project is one of the longest continuous studies of a population of birds in the world. Betsie Rothermel, an assistant research biologist, studies the effects of prescribed forest burns on the recovery of threatened gopher tortoises in central Florida. 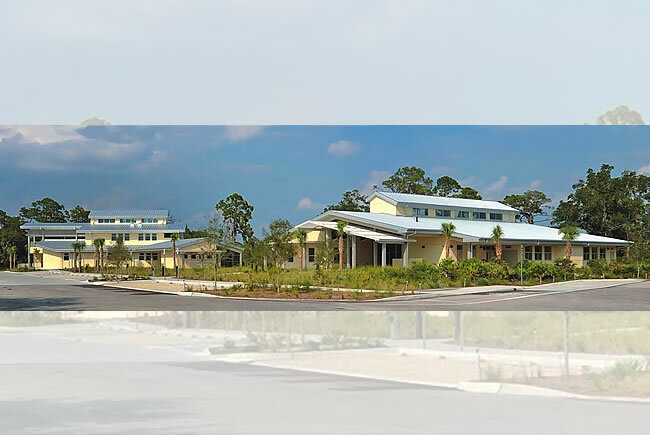 Archbold Station opened a LEED-certified lodge and learning center last year as part of its effort to make the public more aware of its research and conservation programs involving the Florida scrub-jay and Lake Wales Ridge habitat. 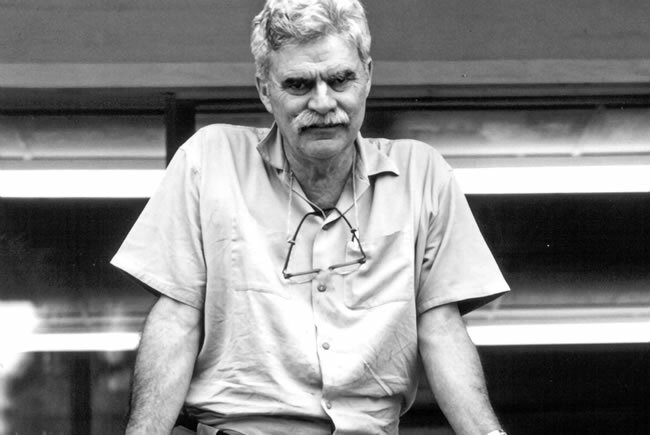 Archbold Biological Station was established in 1941 by Richard Archbold. University, is among a handful of interns working at Archbold. Archbold Biological Station draws scientists from all over the world but has remained low-profile inside Florida. Hilary Swain makes her way through the stunted shrub oaks and knee-high palmettos of Florida’s central hinterlands, a peanut in her outstretched fingers. She makes several bird calls — “spissh, pssish, pssish, pssish, pssish.” There’s a rustling in the brush, and a 10-inch-long, blue and gray Florida scrub-jay flits out and retrieves the snack. Like every jay in this corner of Florida, the bird has a set of leg bands, attached by scientists, that serve as a name tag. Swain, a biologist, runs the Archbold Biological Station, an independent, non-profit research, education and conservation operation located in an out-of-the-way section of Florida along the southern end of the Lake Wales Ridge near Lake Placid. The station — the buildings were once an estate owned by the Roebling family, famous for building the Brooklyn Bridge — is perhaps Florida’s best-kept research secret, overshadowed by the higher profile, higher-tech life sciences research centers along Florida’s coasts and in its universities. 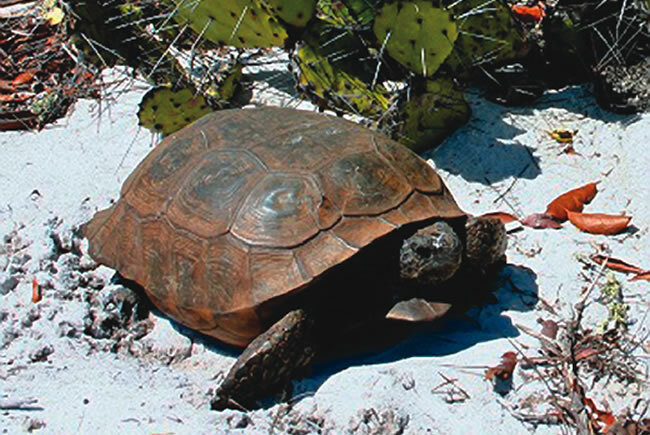 Established in 1941 by Richard Archbold, an aviator, explorer and one of the heirs to the Standard Oil fortune, the 9,000-acre station is dedicated to studying, interpreting, preserving and restoring Florida’s scrub ecosystem, an endangered remnant of the beaches and sand dunes that have stood exposed above sea level for more than 1 million years. 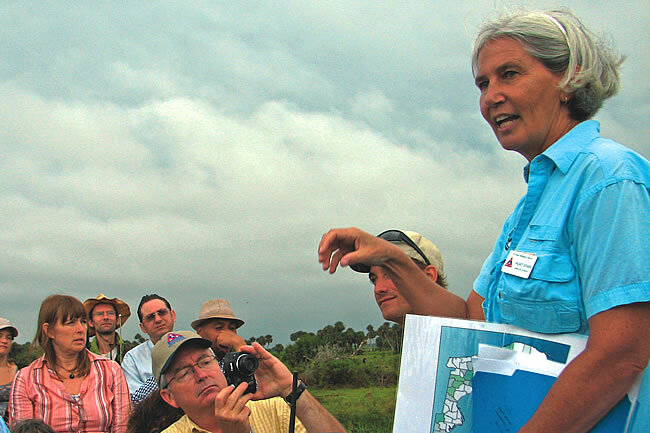 The sandy, dry scrub environment of the northern Everglades is home to plants and animals found nowhere else on earth. 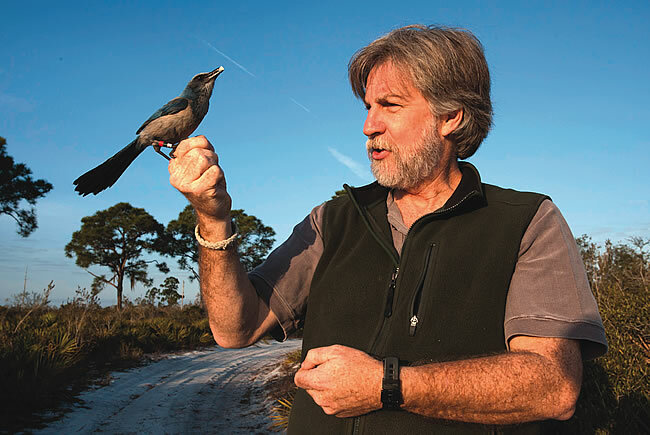 The center’s scrub-jay project, started in 1969 by the late USF professor Glen Woolfenden, is one of the longest continuous studies of a population of birds in the world. The study has revealed key details about the native Florida bird, which is on the verge of extinction. Among the findings: Scrub-jays mate for life and are monogamous. They form close-knit family units — younger birds remaining in the home territory to help feed the young and protect the territory — and need periodic habitat burns to maintain their homes. Archbold’s scientists — nine Ph.D.s and 12 research assistants — also conduct research into other bird species, such as the Great Crested Flycatcher, as well as animals and plants and many aspects of the scrub environment. The center’s primary goal, Swain says, is the long-term conservation of the Lake Wales Ridge environment. “We’re not an advocacy organization, and we’re not involved in permitting. We’re not like Audubon or Sierra Club. We’re not a zoo. We’re not an animal rescue. The idea is how can our knowledge help improve things” in the scrub ecosystem. Eric Menges, the station’s resident plant ecologist, and his team have been looking at how fire affects plant populations. His research has shown that the endangered scrub mint requires a burn every five to 12 years to survive in the landscape. 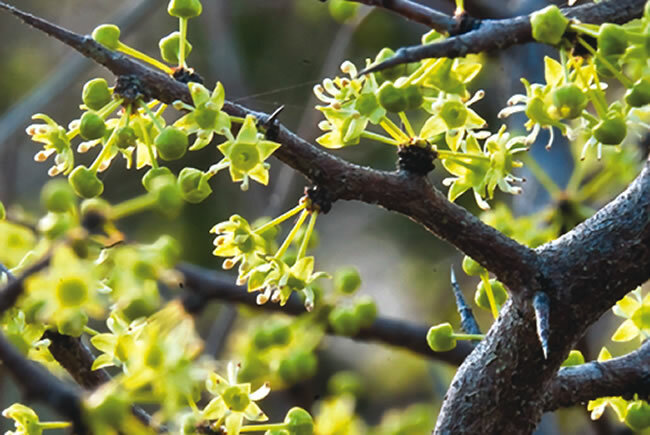 They’ve also been working to introduce endangered plants, like the Florida Ziziphus (below), a small, spiny fruit-bearing shrub, back into its natural habitat. Since 1988, Archbold also has operated a 10,500-acre working cattle ranch in the Istokpoga-Indian Prairie basin in south-central Florida just northwest of Lake Okeechobee. With 3,000 head of cattle, the MacArthur Agro-ecology Research Center at Buck Island Ranch is among the top 20 commercial cow-calf producers in Florida. It also serves as a “living laboratory” where Archbold and its partners — which include state and federal agencies, universities and other environmental groups — explore land management practices that will protect and enhance environmentally sensitive lands on working ranches. A primary focus there, Swain says, is on water management. One pilot project funded by the U.S. Department of Agriculture and the South Florida Water Management District involved creating water retention areas and other strategies to control phosphorous runoff. The program pays landowners based on the amount of water stored and phosphorous removed. While few Floridians outside of Highlands County know about Archbold, the research center is world famous in scientific circles and considered one of the top biological field stations in the nation. Each year, science graduates from many of the nation’s top universities compete for one of Archbold’s coveted research internships. During the six-to-12 month program, interns live at Archbold and assist the station’s scientists while working on their own research efforts. 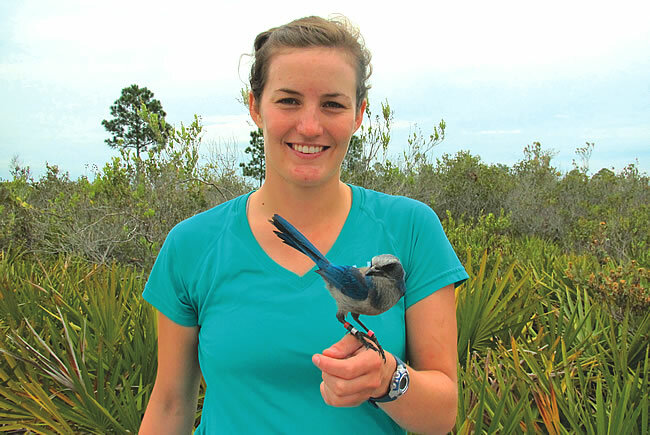 Caroline Rusk, a 2012 graduate of Cornell University, is among a handful of interns working in Archbold’s avian ecology lab. In addition to assisting on the center’s scrub-jay project, which involves mapping every territory and locating every nest, Rusk is doing her own study on scrub-jays’ foraging behavior. The experience, Rusk says, is “ideal for a student contemplating graduate school,” providing the chance to experience the “rigors of field research firsthand” but doing so in a nurturing environment without the high-stress atmosphere that one usually encounters in graduate school. The station has found that income from Archbold’s $37-million endowment (as of 2011) covers only about half the cost of its operation. The other half comes from grants and donations. It has hired a development staff to create a giving program. In addition, the station is reaching out more to the public — last year it opened a learning center for college classes and added lodging to house visiting scientists.